If variety be the Spice of life, look beyond this pub! 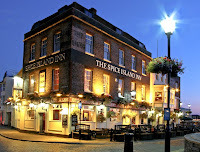 The Spice Island Inn is situated in Old Portsmouth overlooking the busy Dockyard and Harbour, making it a haven for visitors looking for a drink and pleasant views in the summer months. As you sit watching the ferries coming to and fro, it appears to have a fantastic place to have a meal. Appearances, however, can be deceptive. Despite its location and views, parking in the area is difficult. The easiest option here is to park away from the area and walk to the pub (more pleasant to do so on summer evenings, but not when the Grub gang visited!!) The Gang were a little down hearted to begin the evening, with our venues selector being unable to join us and with all routes into Old Portsmouth being closed due to road works, we needed a little cheering up! It was a promising start. Nice old building dating back to the 1700's, pleasant decor and friendly staff. The menu didn't wow us, but the staff dutifully encouraged us by explaining the specials and their best meat/fish dishes to sample. Our waitress had definitely tried the food herself. We were able to go for a 3 course meal with a soft drink. The specials board offered us a little relief from the main menu and proved to be a popular choice for a starter option in the form of crab meat salad, which was opted by the majority of the group. The starters were delicious - could not fault them and we started to feel a bit happier. But, in true Grub gang style, we battled on to allow the venue to redeem itself. Lets try the desserts!! My trio of desserts was very tasty, although one of them had been collapsed (perhaps to test if it was hot enough) and the chocolate brownie tested by Gemma, was a little rich for her liking a with too much chocolate sauce on it. In her words "a little too sickly". So, we asked for the bill. It came quite quickly, with an added bonus of someone Else's drinks on it!! Not such a good way to end a disappointing evening. It turns out, we were not the only people experiencing incorrect bills either due to the staff allowing one table to leave paying a bill which had items missing! Well. at least they had a good evening! !